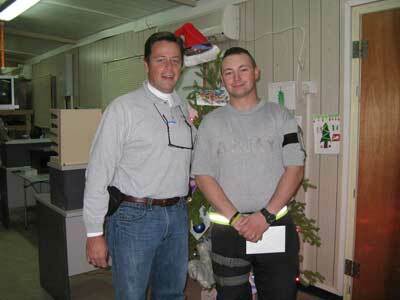 Colonel James Brown, the commander at Camp Bucca, walked into the office where Donahue and a modestly decorated artificial Christmas tree were waiting. The intense and highly energetic Brown had someone to introduce to Donahue that might help him to feel more at home. The story of how two Indiana corrections professionals came face to face in the Iraq desert can be traced to last fall, when the U.S. Army Secretary, Pete Geren, asked Donahue to go to Iraq to review the coalition forces’ detention operations. 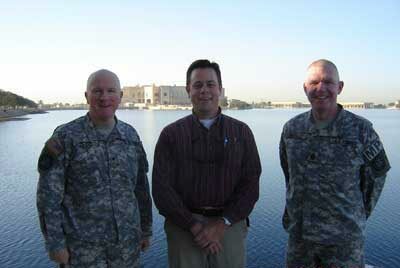 Donahue visited Iraq nearly one year after President Bush’s much debated 2007 troop surge. As the security presence in Iraq increased, so did the number of suspected Iraqi insurgents in U.S. military custody. The estimated number of detainees at the beginning of 2008 was 24,000, but Donahue says those numbers are now on the decline. The U.S. camps, also referred to as “theater internment facilities” or TIFs, do not hold individuals sentenced for a crime: there are no fixed terms of detention. After capturing detainees, the military holds them until it can determine whether or not they can be safely released to the community or be referred to the Iraqi courts system. To combat hopelessness among the detainees and to prevent the camps from becoming recruiting centers for radical militant groups, the Army is taking a decidedly corrections approach toward its detention operations. In fact, correctional fingerprints can be found all over the camps, from the developing educational, vocational, and religious programming to the review boards that operate much like parole board meetings. Donahue heard the “hope and opportunity” mantra throughout his time at Camp Bucca and Camp Cropper, a much smaller detention camp to the west of Baghdad in central Iraq. Major General Doug Stone, commander of detention operations in Iraq, has been the driving force behind promoting a variety of opportunities for former militants who will be returning to society. The educational component is also a vital security tool for the Army. For example, the Army hopes that teaching the detainees how to read will allow them to interpret the Koran for themselves, rather than believing what extremists tell them. As he learned more about this programming, Donahue once again found a fellow corrections professional on the front lines. The Army is currently working on making the educational programming available to the nearly 24,000 detainees throughout Iraq. It’s a daunting task, but one, Donahue says, everyone is eager take on. INDOC currently has 99 staff deployed in the military, which is not an uncommon number for many state corrections departments. During his visit, Donahue met several staff from different U.S. corrections systems. The connection between corrections and the Iraq war is strong, not only through its people, but also through its philosophy and mission. Back in the U.S. at INDOC central headquarters the name of every employee serving in the military is listed on the lobby wall. It serves as a reminder for all those who walk by to keep these individuals in mind, no matter their connection to or view of the Iraq War.